The Coonley Estate was built by Frank Lloyd Wright and originally included the House, the Stable, The Gardener’s Cottage and extensive gardens. Jens Jensen designed and implemented a landscape plan in 1913 for the property which utilized Wright’s hardscape plan. Today the landscape contains a number of oak trees predating the house and hawthorns planted by Jensen. The restored landscapes of the main part of the Coonley House and the Stable (Coach House) include Jensen’s landmark features: hawthorns, oaks, red bud, sumac, blackberries and mature shrubs, flowers, ferns and grasses. A grove of birch trees and ferns has been recreated on the front grounds of the house. The living room unit and its walled garden are the center of the house. The garden features a terrace with 10 planters, a pergola and a reflecting pool. Nasturtiums grow in the planters and native water lilies bloom in the pool in summer. Wright created a walled sunken garden to unify the Coonley House and the Stable. The walled garden was restored in 2007. Wright’s original sidewalk garden plan and concrete hotbeds were recovered by removal of extensive invasive species trees and shrubs, construction debris, and incorrect patio tile and dirt. The entire original sidewalk system was restored or, in places, recreated. Jensen’s design for a pool with eight surrounding iris beds was implemented. Other beds in the sunken garden and the stable yard and front yard were planted with native plants. 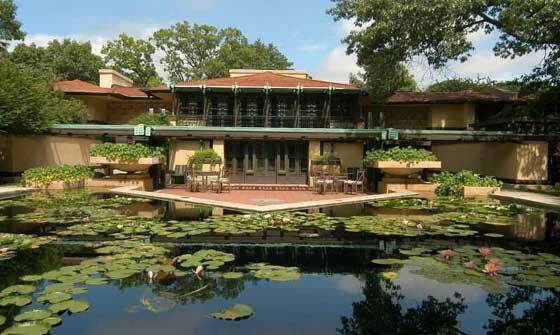 The Prairie School represented here by both Wright and Jensen was an important part of the American Arts and Crafts movement of the early 20th Century.